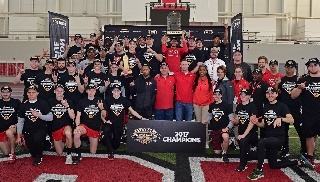 The Youngstown State men's track and field team had an impressive showing over two days as the Penguins won their second consecutive Horizon League Indoor Championship with the meet concluded on Sunday at the WATTS. The Penguins finished with 188 points while Oakland finished second with 157 points and Milwaukee was third with 108 points. Chad Zallow had a banner day on Sunday winning the 60m dash, the 60m hurdles and the 200m dash. Ryan Booth won the shot put, Arnaldo Morales captured his first career high jump title while freshman Tim Holzapfel set a school-record in a winning the hepthathlon. Morales started the day on a high note for the Penguins winning his first career indoor high jump title. Morales cleared the bar on his second attempt at 2.08m to claim his first crown after placing second the previous two years. Holzapfel finished off the heptathlon with a school-record performance scoring 5,276 points. He eclipsed the previous mark by 455 points. He scored 937 points in the 60m hurdles and had 796 in the 1,000m run. Zallow, who has turned heads all year, won the 60m hurdles in Horizon League Championship and WATTS record time of 7.61 seconds. It marks the fourth time this year that Zallow has clocked a time of 7.61 seconds. About a half hour later, Zallow sizzled again with a time of 6.77 seconds to win the 60m dash. The time was a Horizon League Championship record and marked the second straight year he won both the 60m dash and the 60m hurdles. Zallow's next race was the 200m dash and it was the closest race of them all. In the first heat, Oakland's Nicholas Girodat posted a time of 21.51 seconds. Zallow just nipped him at the line in the second heat running a 21.50. Booth defended his Horizon League shot put title with a career-best throw of 18.40m. Booth had three throws of longer than 18 meters while his fifth throw being the winning mark. He won by 1.34m. Earning awards for their performances during the meet included: Zallow (Outstanding Performer - Running Events), Brendon Lucas (Freshman Running Performer), Holzafpel (Freshman Field Events), Morales (Outstanding Performer - Field Events) and Brian Gorby (Coach of the Year). Zallow was also named the Alfreeda Goff Male Track Athlete of the Year. Other top performances for YSU on Sunday. Brendon Lucas second in the 400m dash with a time of 48.86 seconds. Brad Jones third in the high jump clearing a height of 2.05m. Isaac Agyemang was third in the hepthalon with a career-best 4,933 points. Dom Westbay finished third in the shot put with a throw of 16.90m. Lasander Washington was third in the 60m dash (6.96 seconds) and Carl Zallow was fourth (6.97 seconds). Ryan Sullivan was third in the 3,000m and Alan Burns was fourth in the 3,000m.